A stylish disposition starts with premium accessories. Rooted in luxury, Aspinal of London's selection of Black Leather Belts will meet the expectations of any discerning gentleman. 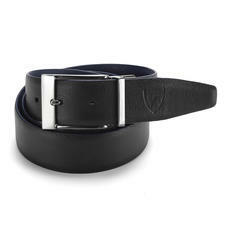 Choose from a selection of formal and relaxed styles to pair with tailored trousers, jeans and chinos, each handcrafted from the finest full grain Italian leather and finished with exquisite silver tone brass buckles. From premium saffiano to mock croc and sumptuous suede, timeless quality runs through the collection. 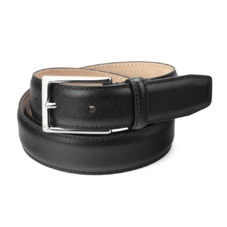 The Aspinal Men's Black Leather Belts collection offers a selection of beautiful handmade Italian leather belts in three classic styles; signature mock croc, classic plain and a saddle stitch design. 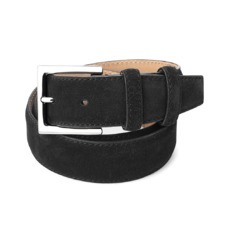 Each black leather belt is handmade by our master craftsmen using only the finest full grain leather on the outer side, full grain nubuck to the inner side and finished with dual belt loops and a classic styled Swiss made brushed nickel buckle. All of our men's black leather belts arrive beautifully gift wrapped and boxed in Aspinal exquisite signature presentation.